The Maximizing Access to Research Careers (MARC) Undergraduate Student Training in Academic Research (U*STAR) is sponsored by the National Institute of General Medical Sciences (NIGMS). 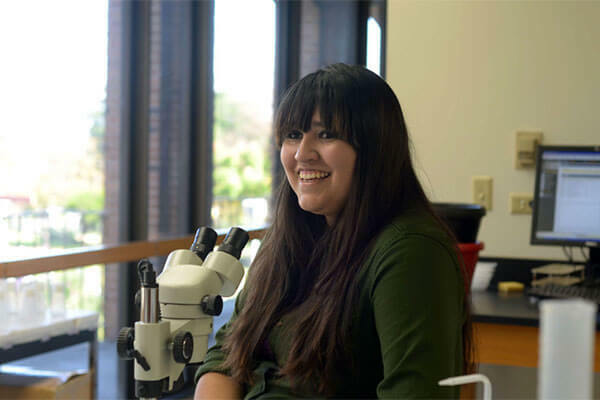 MARC U*STAR provides underrepresented students majoring in Biology, Biochemistry, Chemistry, Biophysics, Environmental Science or Engineering Science opportunities to complete biomedical research training and work alongside faculty mentors in the biomedical sciences. Undergraduate students participating in the MARC U*STAR program are provided with academic and research support to prepare them for Ph.D. programs in the biomedical sciences. The program offers students numerous benefits, including academic year and summer research experiences at designated laboratories, opportunity to present at annual campus-wide symposium, attendance at scientific conference (travel related costs are paid), professional development including colloquiums, seminars, and workshops, as well as stipends ($12,336/year) and tuition assistance. The MARC U*STAR program aims to produce competitive candidates for Ph.D. or M.D./Ph.D. graduate programs in the biomedical research field. The MARC U*STAR program provides students, traditionally underrepresented, opportunities to gain knowledge about the field by offering workshops, seminars, and symposiums. Students participating in the MARC U*STAR program receive the academic and research training they need to succeed in a doctoral program, including GRE preparation. Students in the MARC U*STAR program participate in research projects with faculty members in the biomedical research field on a year-round basis. Must be interested in attending graduate school and obtaining a Ph.D. If you are interested in learning more about the MARC U*STAR and/or the Pre-MARC programs and their outstanding benefits, please contact Veronica Contreras-Shannon, Ph.D.
Current St. Mary’s students may access the MARC U*STAR program application and requirements on Gateway.